In this two hour episode we learned how Elsa actually got into the urn, Emma finally got control over her powers and Regina learns an important lesson with the help of Robin and the storybook. Ana actually was the one who put Elsa into the urn but only because she had The Spell of Shattered Sight cast on her. She was consumed by her biggest dislike for her sister. Through the lens of the spell she saw Elsa as someone who had left her and forgot about her. The way the spell works is it brings out that deep dark issue and lets it consume you. Ana’s anger at her sister consumed her and the only solutions she saw was to put her sister in the urn. This was not how The Snow Queen wanted the situation to go. What The Snow Queen actually wanted was for Elsa to freeze Ana. She wanted Elsa to embrace her full power and use it on her sister. But unlike Ingrid, Elsa is not consumed by anger and betrayal. Even with her sister standing in front other telling her how angry she is and how much she hates her, Elsa sees that it is a spell. Elsa knows that this is not how her sister truly feels about her. As Ana opens the urn Elsa says, “No matter what Ana, I love you.” Even as her sister imprisons her she will not lose her love for her sister. Unlike Ingrid, who was put int he urn thinking she was hated and despised, Elsa went in knowing that the words thrown at her were not what her sister really felt for her. As I stated in my last review, Greta made her decision to put Ingrid in the urn out of fear, anger and overwhelming sadness Did she truly hate her sister? Did she really see her as a monster? If she had kept her memories would she have eventually realized what she had done? Would she have understood that Ingrid did not mean to hurt Helga? Would she have stood by her sister’s side? We will never know but I feel she would have ended up much like Elsa at this point. She was upset at the death of her sister (which is obviously completely understandable) but once she had a chance to process what happened and realized that her sister didn’t mean to do it, she would have clung onto her remaining sister. She made her choice while she was blinded by emotion. Now I know Ana did not witness Elsa kill anyone but when she put Elsa in the urn she was doing it out of pure emotion. She was angry and upset exactly like Greta was. But Elsa left the urn only concerned about her sister. Elsa did not stew in betrayal, she held the love of her sister in her heart. She knows her sister, she knows what happened and held that love as close to herself as she could. She did not let go of that love. Her love for her sister is pure. Elsa has always said that she can control her power because Ana had faith in her and because she loved her sister. Ana had faith in her and she used to that to keep herself under control. Emma thinks that same logic, her love for Henry, can help her control her powers. But it doesn’t work. She ends up hurting her son and that makes everything worse. What Emma learns form Elsa is that while the love and support of family is important you also have to have belief in yourself. It does not matter how much someone says, “You can do it,” it won’t happen if you don’t believe it yourself. You will not put the whole effort into it or you’ll make the wrong choices. In the end love and belief in yourself is just as important as love and belief from your loved ones. Regina learned that lesson as well in this episode . After she spent the night with Robin she showed him the book and tells him that because of the book she can’t have a happy ending. She firmly believes that whoever wrote the book wants to keep her as a villain. She thinks that this is a classic fairytale book which means villains remains villains and heroes are heroes, there is no wavering. She firmly believes that this author does not want to her ever live happily. Regina has always put way too much store by the book. She blames the book for her life and the wrong choices she has made. She thinks changing it will fix everything and right all the bad choices she made in the past. She has too much faith in what the book can supposedly do and what is says. She is letting her past rule her present. The book is just one way her story could have gone. Robin Hood, because he loves Regina, goes with Will to try to find a way of finding the author. While they are in the library a new pages appears in Robin’s bag. 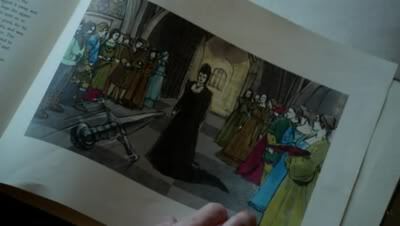 This page shows what could have happened if Regina had gone into the pub and met Robin Hood when she first was shown him. Regina sees this and is at first confused. Robin tells her that the book is showing her hope. If she wants a happy ending it actually is possible, if she believes it is possible. Robin tells her that her choices in the past have led her to this point. Just as in the past her choices now will determine where her life goes. What she has to stop doing is sabotaging herself. She thinks nothing good can happen so when it does she pushes it away. She makes poor decisions because she assumes that is all she can do.Which is not true. Of course you get a un-happy ending when you make choices that hurt others or hurt yourself. What the pages shows Regina is that if she hopes enough and believes in herself and her potential she will began making choices that will lead her to happiness. The happiness is there, she just needs to take it. There are also two other quick observations I had about this episode. First I found it very interesting how upset Henry was at being ordinary and not having magic. While Emma wanted to rid herself of the magic and wanted to be ordinary. It is an interesting look at this situation because it shows the everyone wants to change what they have. Everyone, magic or not, sees themselves as inadequate at times. We all want something to make us better. The one with the magic wanted it gone because she thought that would solve her issue. While the “ordinary,’ one thought magic would solve everything. In the end we see that embracing who you are fully who you saw yourself and those you love. The other thing is that this Rumple possessing Hooks heart thing is not going to end well at all. I’m very afraid to see what he makes Hook do and if Hook survives this problem. “Our love made us strong, until it didn’t,”- Snow Queen – That is because you both judged the situation after one reaction to the incident. The belief evaporated and instead of understanding where your sister came from you saw her actions through a lens of hatred and betrayal. “Your royals get to exhaustive lengths to ignore your issues,” – Kristoff- Very true words there. “Funny thing about magic it can’t be destroyed completely,”- Rumple- This is the second time we have heard this said. What does this mean for something like The Spell of Shattered Sight? It can be lifted but ultimately not forgotten? “Do You get a quarter from the hope commission every time you use that word?” – Regina- While this is a humorous line, she has a point. Snow lives her life with hope, always. And look how happy she currently is. She may say it a lot but there is a reason for that, one Regina needs to pay attention to. “Happy endings can take a long time, but they do happen,”- Apprentice – Words that many of our characters should live by and understand. Is Ana still frozen somewhere? Is she alive? How long as it been since Elsa put into the urn? When will Elsa remember what really happened? 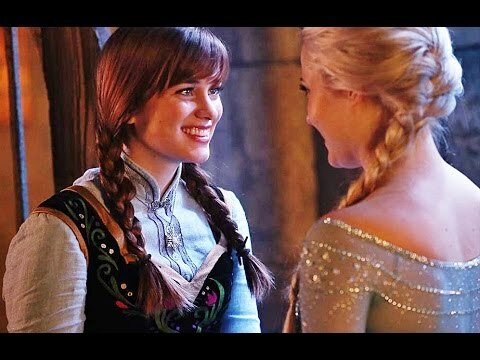 What will the ribbons do to Emma and Elsa? Will The Spell of Shattered Sight be cast fully and if so what will happen to everyone? If it is cast and everyone hears what others think of them can they forget it and move on when the spell is lifted? How will Rumple end up using Hook? How will not having a heart effect Hook and Emma’s relationship? Did Rumple just doom them? 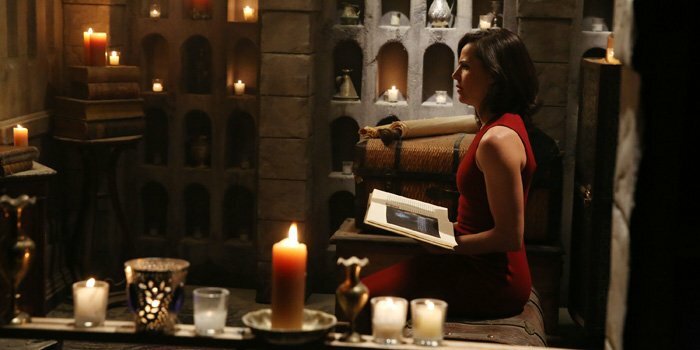 Will Regina be able to work on getting her happy ending? Will they still look or the book’s author? Wha other pages will appear? Will the book be a saving grace for anyone else? Posted on November 17, 2014, in Once Upon a Time, Tv Shows and tagged Ana, control powers, Elsa, Emma, magic, Once Upon a time, Regina, Smash the Mirror, spoilers, tv show review. Bookmark the permalink. 4 Comments. Interesting thought on Henry. I was hoping that Henry will somehow find out what Rumple is up to and be able to alert everyone else (especially with Hook’s situation), kinda hope to see him in a spy mode and gathering information. Though I agree I don’t want him to get any type of magic, he doesn’t need to have it. I’m interested to find out who the author of the book is. I remember August having book pages but I don’t know how many other people dealt with the book. Also I’m hoping they don’t use Henry as a new Sorcerer’s Apprentice / Harry Potter type thing. She got released in the season finale for last season. The urn was brought through the time portal thing with Emma and Hook and the top came off when it landed. She walked out after they left. The urn was in a vault of Rumple’s of things he didn’t understand or know how to use. How did Elsa get released from the urn? I don’t remember.